In a new exhibition of Indian art, San Francisco’s Asian Art Museum takes steps towards accessibility for blind and visually impaired patrons. Closeup of a tactile version of The Hindu deity Kali, by Baua Devi, shows the deity’s face in bright pinks, yellows and blacks with her tongue hanging out of her mouth. On September 7, a new exhibition opens at the Asian Art Museum featuring 17 contemporary artists working in the Mithila style, a traditional style of women’s domestic decoration originating in the Indian subcontinent. The exhibition, Painting Is My Everything: Art from India’s Mithila Region, includes three tactile renderings produced by the LightHouse’s MAD Lab and designed by Hong Kong-based social designer Rico Chan. The tactile renderings are displayed on kiosks throughout the exhibition, accompanied by braille labels and audio descriptions, which can be accessed through the museum’s app. The temporary exhibition features 30 large scale contemporary works on paper from Bihar state, the subcontinent’s rural northeast. It is the first major exhibition in more than a decade to explore how this age-old tradition of women’s domestic decoration has become a vibrant arts movement with a surprising social impact. It is also the museum’s first foray into accessibility in the form of tactile translation, a method that they hope to fine-tune and experiment with in future exhibitions. Mithila style painting is characterized by density of line and texture, strong figurative outlines of brush and ink, fine detailing and elaborate borders, and was originally practiced exclusively by women on the walls of their homes. The art form often depicts rituals or religious imagery, including scenes of weddings, flowers and animals as symbols of fecundity and depictions of Hindu god and goddesses. 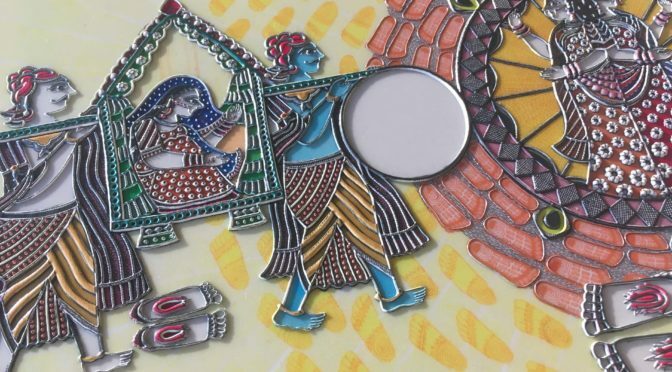 The style of painting is a catalyst of economic growth and social change in Mithila, and for many women, has translated into financial independence and community respect. Women artists make up only 3 to 5% of major permanent collections in the U.S. and Europe, and in 590 major exhibitions by nearly 70 institutions in the U.S. from 2007 to 2013, only 27% were devoted to women artists. A further winnowing occurs for female Asian artists — so there’s a beautiful synchronicity, then, to making underrepresented work accessible to a group who has minimal access to visual art, even in the most established museums and galleries around the world. The idea grew out of conversations with disabled members of the Asian Art Museum when asked for suggestions for improving accessibility at an ongoing series of Disability Community Charrettes. Several blind or low vision members suggested tactile renderings and braille labeling to accompany detailed audio description. The museum involved several of these patrons (with varying degrees of vision) into an iterative process that determined the final tactile design and spatial layout of the exhibition. The tactile kiosks are comprised of slanted counter-height platforms holding the artwork rendered in full color, with the added element of raised tactile lines and textures. The wall behind each kiosk offers a printed sheet with the verbal description of the piece as well as information about the piece in braille on the tactile surface. The accompanying audio description can be accessed via the Asian Art Museum’s app or this YouTube playlist. The setup is meant to allow both blind and sighted audiences to interact with the pieces in tandem and, hopefully, start a dialogue. Painting Is My Everything: Art from India’s Mithila Region runs through December 30. The exhibition is open Tuesdays through Sundays from 10 a.m. to 5 p.m., and Thursdays until 9 p.m. Learn more about accessibility at the Asian Art Museum before you go. The museum will host a focus group for blind and low vision patrons on Saturday, September 29 from 1 to 3 p.m. in hopes of understanding how to further improve their accessibility standards for future exhibitions — RSVP to communityengagement@asianart.org. To contract for custom tactile maps of your neighborhood, workplace or university or propose a museum project like this one, visit http://lighthouse-sf.org/braille-and-accessible-design/. Contact us online or call 415-431-1481. Learn about volunteering at LightHouse. For issues with our website, comments or suggestions please let us know. Founded in 1902, San Francisco's LightHouse for the Blind and Visually Impaired promotes the independence, equality and self-reliance of people who are blind or have low vision. We offer blindness skills training and relevant services such as access to employment, education, government, information, recreation, transportation and the environment. We also pursue the development of new technology, encourage innovation, and amplify the voices of blind individuals around the world.